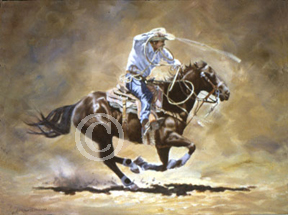 "Calf roping frequently happens on an open range when the yearlings need doctoring and or branding. As a necessary skill for ranching, it became one of the top events at rodeos - racing a clock to rope, tie, and hold a calf. One of the requirements for success in this event is a well-trained athletic horse with intelligence and attitude who will partner with the cowboy to become a winning team. This event is one of the most exciting events at a rodeo."